Andrew Wheeler, a former coal and uranium mining lobbyist, has been named the acting administrator of the Environmental Protection Agency, after the abrupt resignation of Scott Pruitt. Pruitt announced his decision on Thursday, amid a series of ethics investigations into his improper use of taxpayer money and penchant for using employees to conduct personal errands. Wheeler has made a career out of representing fossil fuel interests and rolling back environmental regulations. His relationships with senior officials from the Department of Interior and the Department of Energy, his lobbying background and deep ties to polluting industries have some people worried that his influence could extend beyond the parameters of the EPA. “The extent to which Andrew Wheeler knows how all of these agencies work and did his best to influence all of these agencies prior to joining the EPA is a huge concern,” said Aaron Weiss, a spokesman for the Center for Western Priorities, a nonprofit focused on conservation and energy policy. 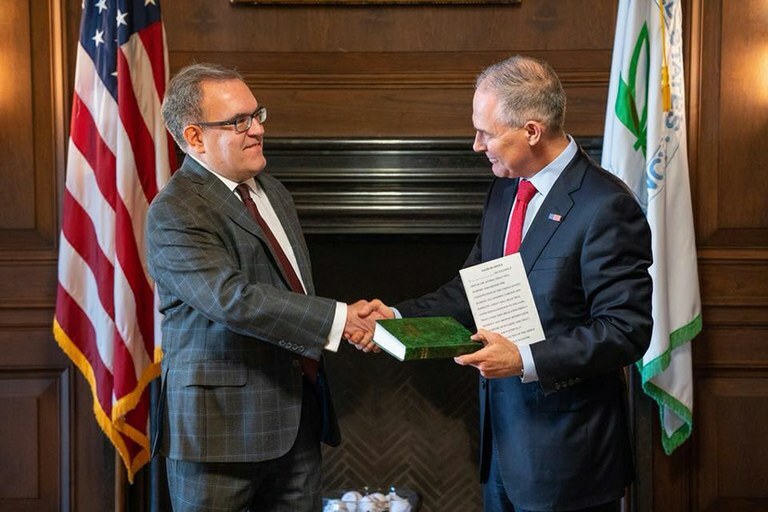 Andrew Wheeler is the new acting chief administrator of the EPA, following the resignation of Scott Pruitt. Wheeler is a former coal lobbyist for Murray Energy and aide to Republican Sen. James Inhofe, a fossil fuels advocate. Wheeler’s positions follow those of other members of the Trump administration, who downplay the need for climate action and environmental regulation. During his time working under Republican Sen. James Inhofe of Oklahoma, a prominent climate change denialist, Wheeler worked on a bill called the Clear Skies Act. Had it passed, it would have stripped protections from the Clean Air Act. Pruitt also worked to roll back the policy during his tenure at the EPA. Prior to being named EPA deputy administrator in April, Wheeler spent several months talking to top officials from the Department of the Interior about the energy and mineral resources located inside the original Bears Ears National Monument boundary on behalf of Energy Fuels Resources, a uranium mining company. The Washington Post reported that the company sent a letter to the DOI nine months before the shrinking of Bears Ears requesting that the monument be trimmed to accommodate areas with vanadium and uranium deposits, confirming suspicions that the motive for altering the monument was driven in part by mining interests. The company also owns White Mesa Mill, the only operating uranium mill in the country, and has several mining claims near the Grand Canyon — where uranium mining is under a 20-year ban. Environmentalists fear that his involvement with such a sprawling uranium power will bleed into his work and priorities at the EPA. It wasn’t very long ago that he stopped his work on behalf of Energy Fuels, “and now he’ll have regulatory power over the industry that he worked for,” said Amber Reimondo, energy program director for the Grand Canyon Trust. Wheeler also has deep ties to the West’s coal industry, working as a lobbyist for Murray Energy, the largest coal mining company in the country. The company operates 13 mines, including three in Utah’s Uintah Basin. In March of 2017, Murray Energy CEO Bob Murray and Wheeler, who was then a lobbyist, made headlines when they held a meeting with Department of Energy Secretary Rick Perry to discuss a plan to revive the U.S. coal industry. Around the same time, Murray also authored a letter to Vice President Mike Pence detailing a wish list of actions he wished to see prioritized under the current administration, including slashing the EPA’s staff in half and eliminating the Clean Power Plan, an Obama-era proposal that limited pollution and prepared the country for a transition to renewable energy. Under the direction of Pruitt, the EPA has begun to implement some of these goals, including drafting a replacement to the Clean Power Plan. In addition, the department has seen staffing levels drop by over 700 people, putting the agency at the lowest employment numbers it’s had in 30 years.